Combine Print2RDP with a Black Ice Printer Driver or Print2Email to enable Terminal Server users to convert, attach, and e-mail any printable remote document via their local e-mail client! Using software based on Black Ice Software's award-winning Printer Drivers, local users can convert, attach, and e-mail documents from a Terminal Server session directly to their local MAPI e-mail client, or locally set SMTP mail server! 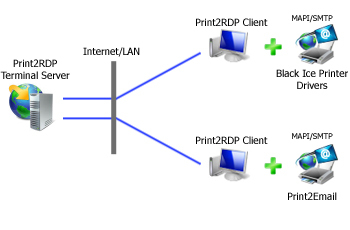 Connect to a Print2RDP Terminal Server and print to the automatically-created virtual printer driver, and watch as your document is automatically converted and attached for e-mail address entry, or even automatically sent to a designated e-mail recipient.